Southern Stars has a long history in the space business. We’ve been developing planetarium software since 1993. Our SkyChart III for Mac and Windows won Sky & Telescope magazine’s first Hot New Products award in 1998. In June 2009, we launched our first iPhone app, SkyVoyager, now renamed SkySafari. Simultaneously, we developed SkyFi, the first wireless iPhone-based solution for telescope control. That product, and the iPhone app, won a Best of Show award at MacWorld 2010. In January 2011, we released SkyWire, the world’s first Apple-approved serial cable for iPhone/iPad/iPod Touch. Engineered by Redpark Product Development, this product has become the global standard in serial communication for iOS devices. Later in 2011, we released SkySafari 3 for iOS, SkySafari for Mac OS X, and an Android version of SkySafari. Sky & Telescope magazine named SkySafari 3 a top new Hot Product for 2012. SkySafari 3 has been officially endorsed by Astronomers Without Borders as its preferred mobile astronomy app worldwide. In December, 2013, the SkySafari astronomy apps for iOS, Android, and Mac OS X were acquired by Simulation Curriculum Corporation, along with the SkyFi and SkyWire telescope control accessories. Southern Stars continues to play a consulting role in SCC’s continued development of these products. As of 2018, the iOS and Android versions of SkySafari have been downloaded more than 5 million times from the iTunes Store and Google Play. The success of SkySafari let us go where no app developer has gone before. in 2012, Southern Stars conducted a successful crowdfunding campaign to launch an educational CubeSat mission called SkyCube. The satellite was launched from the Mid-Atlantic Regional Spaceport on 9 January 2014 on the Antares/Cygnus Orb-1 resupply mission to the International Space Station. SkyCube deployed from the ISS into its own orbit on 28 February 2014. Contact was established on 27 March 2014, demonstrating that the satellite had (mostly) functioned for a month on orbit. SkyCube re-entered the Earth’s atmosphere on 9 November 2014. In 2015, we worked with Pumpkin, Inc. to develop a hosted payload aboard the “Beta” mission of Pumpkin’s SUPERNOVA 6U CubeSat bus. Since that time, we’ve assisted other clients with nano-satellite licensing and regulatory issues, mission planning, and project management. With our roots in astronomy software development, our expertise in telescope control, and our growing experience with small spacecraft missions, the sky is truly no longer a limit! Southern Stars Group, LLC is incorporated in California, and headquartered in San Francisco. Our mission is to help people tap into their natural curiosity about the cosmos, via the mobile devices they use every day. Our market is the hundreds of millions of people worldwide who have a curiosity about the universe, and are willing to purchase a mobile app which helps them learn more about it. Our motto is: We Bring Space Down to Earth! Southern Stars are a talented, quirky, and fun-loving group of people with diverse talents and interests. Here’s a little more about the folks who’ve made our products great. Tim has been writing astronomy software since his high school days. After graduating from MIT in 1993 with a degree in Earth, Atmospheric, and Planetary science, Tim found himself in Silicon Valley when the internet boom began. He held engineering positions at several financial services and technology companies throught the dot-com boom, and returned to his “astronomical roots” after the bust. 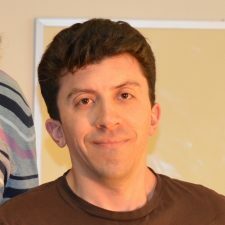 As product architect at Carina Software from 2004 – 2010, Tim oversaw the development of the Voyager astronomy software through multiple OS releases and revisions. Tim was also one of the two principal designers behind the award-winning SkyVoyager iPhone app. Tim currently resides in San Francisco, California. 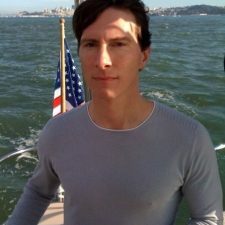 In his spare time, he enjoys cycling, backpacking, skiing, and sailing on the San Francisco bay. 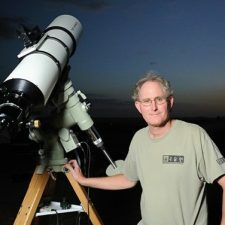 Bill is a talented software architect and a passionate amateur astronomer. Bill worked closely with Steve Jobs at NeXT, where his passion for elegance and simplicity in user interface design was engrained. Bill’s also been doing astronomy for more than 25 years. Bill contacted us during the bottom of the “great recession” of 2009 after the startup he’d been working for had folded. From that initial contact came the award-winning SkySafari iPhone app – and a full-time position at Southern Stars. Bill currently resides near Boulder, Colorado, where he is able to enjoy the great outdoors – both daytime and night. Arron is a graduate of UC Berkeley. 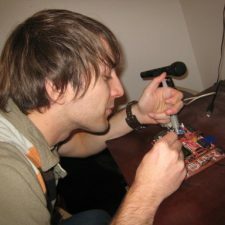 Aaron obtained a PhD in Electrical Engineering and Computer Science in 2006, and his name is already on several patents. While employed as a full-time CAD software engineer, Aaron developed the hardware and firmware for our SkyFi wireless telescope controller on his spare time. Aaron also lives in San Francisco, where he can be found playing the guitar madly, and screaming into microphones at various hangouts in the local music scene. 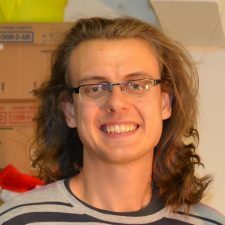 Scott Cutler is a full-time graphics software developer at NVidia Corporation, and a consultant to whom we regularly reach out whenever we come across a “stumper.” Scott wrote most of the firmware for our SkyCube nano-satellite, and is also an expert in software defined radio. Scott’s broad range of technical skills and experience lead him to quickly solve seemingly-impossible tasks. And despite being one of the most frightfully intelligent human beings on the planet, Scott is an incredibly laid back, easy going guy who enjoys hiking, skiing, and amusing his cat Nibbler in his spare time. Rouslan Dimitrov hails from Sofia, Bulgaria, and has been a close associate of Southern Stars since 2012. Now a permanent US resident and full-time NVidia employee, Rouslan is a top-notch electronic hardware designer. He built SkyCube’s flight electronics from scratch. Rouslan’s other technical areas of interest include audio hardware and virtual reality systems. When he’s not conquering the future, Rouslan can be found rocking his electric guitar, storming venture capital parties, and charming the ladies of Silicon Valley with his “can-do” demeanor and suave European accent.